Mayfair takes its name from the ‘May Fair’ held there annually until well into the 1700s. The area came into the Ownership of the Grosvenor family in 1677 but it was not until the mid 18th Century that the Land started to be Developed into what was to become the most fashionable District of London in which to Live, Work and Play. 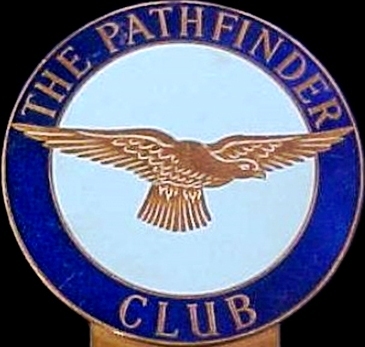 The 2 Guineas Membership of the Pathfinder Club could be paid in 2 instalments in those austere times; it was operated by the Pathfinder Association at 115, Mount Street, London, W1, was open to all Serving and ex-Service members of the RAF and Commonwealth and Allied Air Forces. Pilots visiting London are invited to become Guest Members and to use the Club Rooms. (S/L G A Thome, DSO, DFC, the Secretary, is seen near the Bar). New Residential premises for Provincial members were officially opened at 118, Mount Street, Manageress of the Residential Quarters just beyond the Butcher’s Shop (No.117) was Miss Hilda Godsmark. From 1944 George Alexander Thorne ran the Pathfinder Club (at No.115 near the Berkley Square end ) until about 1956. There was a club bar and dining area in the basement extending under a Butcher’s Shop (Allan’s) and overnight accommodation available above and in the building next door to the Butcher’s Shop (118). “Down Your Way” (BBC Home Service programme) visited the Pathfinder Club and there was a 78 rpm disc of the programme. Letters were written by G. Alex Thorne DSO DFC, Master Bomber, one of the founder pilots of the Pathfinder Force 635 Squadron to his Navigator Boris Bressloff DFC who was then stationed in Bangalore. Later in life he wrote “Lancaster at War 4: Pathfinder Squadron” published by Ian Allan ISBN: 0-7110-1882-0. When I first read the book, I sat up till 3 in the morning wondering if he got back from the various missions! Statistically he should have been killed 3 times over. Robin Richardson, the club chairman had brought his wife Bunny to the closing party. He met her when she was a WAAF driver and could siphon petrol to put into his old Morris car. Remember we used to sleep in that little 2ft 6in bed? She said, nudging him. We weren’t married. Remember that night when 2 bombers collided on the circuit and they thought it was a raid? He had to hide me in the bathroom. She looked again, fondly at him. Marriage can be built on worse foundations. As fast as they received new supplies of Pathfinder Club ties they sold out. Early ties were made from a woolen mixture but later supplies were made of pure silk. These were in dark blue or maroon (both with the Golden Eagle of course) and were available to members from July 1950 for 18s/9d post free. 1 – The tie, was maroon in colour with diagonal rows of the PFF badge in gold. 2 – It has a navy background with blue and gold diagonal stripes. (blue wider than the gold). In between each row there is a diagonal row of gold Pathfinder Badges. (or Eagles). Makers name Toye Kenn & Spencer. The firm of J.R. Gaunt & Son was established in 1884 when John Richard Gaunt and his eldest son, Charles Frederick, left their employment with the long established London military buttonmakers Firmin & Sons to set up on their own. The firm, originally based at the intersection of Clifford Street and Furnace Lane in the Birmingham district of Lozells, prospered and began to supply badges and buttons to uniformed organisations all over the World. By 1895 the business had moved to the city’s Warstone Parade; 4 years later it was incorporated as a limited company and by 1905 had opened a London office in Conduit Street. After the First World War they purchased a number of other insignia manufacturers, including in 1924 Jennens & Co Ltd, the prestigious family firm of Royal button and Military Ornament makers founded in London in the early years of the 19th century and whose buttons were made at the Jennens-owned Deritend Button Works. With the acquisition of the Jennens business Gaunts moved their London base to Warwick Street. The Pathfinder Club eventually merged with Edith Sitwell’s ‘Sesame Club’ as did the Goldfish Club (for Ditched Airmen) and all the old PFF Squadron Badges were removed before the last night party held for the Master Bombers. They moved into the premises of the Sesame Club which occupied No. 49 Grosvenor Street and its mews buildings at the rear (now No. 18 Mount Row). The hushed atmosphere within the Sesame Club was that of a dignified refuge for the elderly, solicitously served by old retainers. With younger members and club servants away on military duties, it was a backwater harbour for old ladies, a shelter from the clattering impact of wartime outside. Edit Sitwell, with her aristocratic style and magnificent presence, always excited their curiosity, not least on that day when she entered the dining-room attended by a fireman – young, tall and handsome, but nevertheless a fireman. One could sense their dismay at her social effrontery. During WW-II a few bars in London were very popular with RAF-aircrew. among them were The Brevet Club, Oddenino‘s and The Shepherd’s Club. The Boomerang Club, which is for for Aussies (RAFA), was the best serviceman’s centre in London. It was a really swell place if one wanted to meet another cobber – it was a good place. “The Orchard” in Ruislip, next to RAF Northolt was the favourite of Polish crew stationed there. Pilots frequented the Trocadero on the corner of Shaftesbury Avenue and Windmill Street. The Café Royale on Regent Street just off Piccadilly Circus. Established in 1865 by a French wine merchant, was considered one of the more famous and glamorous restaurants in London in the 1930s, and is still in business today. The Shepherd’s Tavern a smallish corner pub, with an upstairs restaurant and function room. Licensed in 1737 and known variously as the Ducking Pond, Dog & Duck and Crown until 1769, when it became the New Chesterfield Arms until rebuilt in 1938. Close to the RAF Club in Piccadilly, this pub was a main drinking haunt of Fighter Command in WW2. “It was like a dream to suddenly own the oldest butchers in England and one with the most prestigious history. 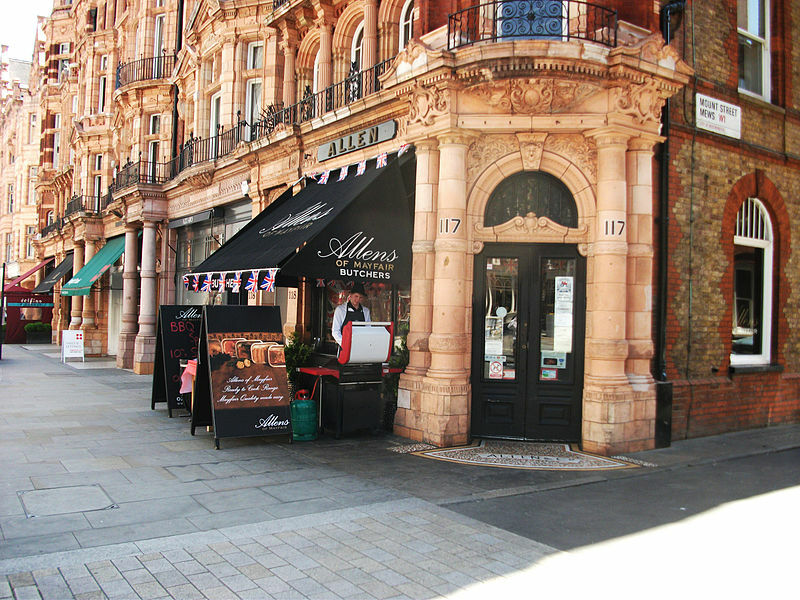 There is no other meat supplier with such heritage and credibility and much of this is owed to its magnificent location in the heart of Mayfair. There is most definitely a ‘Mayfair Community’ and Mount Street often feels like its own little village. This is most apparent at weekends when the offices are shut and the streets are less hectic. You can recognise and chat to regular faces and really get a feel for who’s a ‘local’. But we cater for a varied clientele through the week, from foodies travelling far and wide to buy at an iconic butcher to Taxi Drivers keen to grab a deal on what they know will be exceptional quality.” 118 Mount St was next door to the Butchers Shop. 109 Squadron –from 2 Group, flying Wellingtons, but shortly to be re-equiped. 105 Squadron – June 1943 – Later in that same month the PFF HQ was moved from Wyton to Castle Hill House in Huntingdon, where it remained for the rest of the War. The Pathfiner Force would eventually be entirely equipped with Lancasters and Mosquitoes, the most suitable Aircraft for its Task.